What has the UNs idea of Sustainable cities and sub-prime got in common? The Economist Magazine has an article titled Sub-prime with the subtitle: Greener thinking for the poorer cities. I like the title “sub-prime” but for a different reason. And I would use the subtitle – “Shuffling deck chairs on the Titanic”. The article talks about World Habitat Day which was marked by a prize rewarding smart urban planning. Habit is a United Nations’ organisation tasked with improving our urban fabric. In the next 20 years 2 billion people are going to move into cities from the land. That is equivalent to almost one third of the current global population. “It’s the equivalent of adding a Pittsburgh, Manchester, or a Hanoi to the planet every week,” says Michael Cohen of the New School in New York, one of a group of urbanisation experts gathered at Habitat’s headquarters in Nairobi recently to help the agency map out a plan to raise public awareness of a potentially grim future. The group apparently had a problem agreeing what Habitat’s tentative campaign slogan of “sustainable urbanisation” meant. Apparently, one thought is to emphasise the positives of cities. They can be the solution instead of the end game. Properly managed they can slash emissions, grow knowledge and creativity, and haul billions of poor out of poverty. Really – raising people out of poverty? For how long? That is what the sub-prime housing market in the USA was supposed to do and for a while it looked like it was working – housing prices could keep on increasing for ever couldn’t they! House price multiples of 9 times median earnings were suddenly sustainable in the long term even though historically the sustainable ratio was more like three. 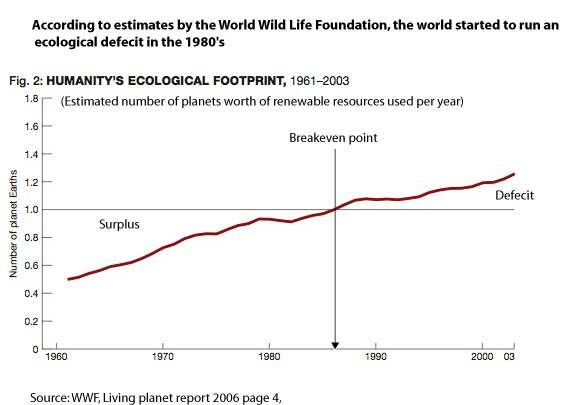 When is humanity really going to wake up to the fact that it is running up an ecological debt – and probably has been doing so since the 1980’s. “Sustainable cities?” – really. 1984 double speak – hire the spin doctor and create a music clip for MTV, recruit a Hollywood star and everyone will live happily ever after?. It seems like these guys at the UN are smart enough to be able to identify the underlying facts about the nature of the demand of cities on our ecological support system but then fail to take the next step and identify the consequences. From a big picture perspective, these new cities are the equivalent of the new housing stock created by the sub-prime lending in the USA. They are adding to an unsustainable debt burden to the planet that will eventually burst. The earth is heading for it’s Titanic iceberg moment. This time we have the data. We don’t need rocket science to work this one out. The mathematics is very simple. Consider this question. Imagine there is a pond with lilies growing in it. The surface area of the pond covered by the lilies doubles each day. The pond starts empty and is fully covered by the lilies on day 30. On what day is the pond half covered by lilies? The answer is day 29. In other words right up until day 29 everything looks fine and we still have a lot of room to play with. Then it all goes wrong very quickly. 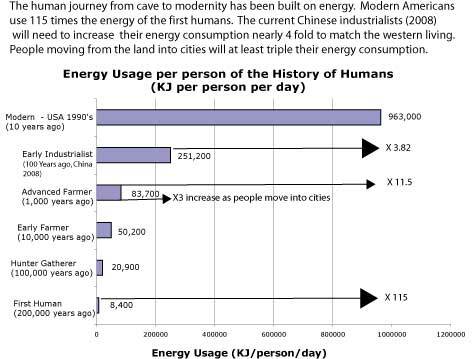 We are not dealing with linear issues – moreover we don’t just have the one exponential issue – we have multiple exponential growth factors combining with each other like population growth, energy consumption and per capita consumption on non renewable resources. We might well ask ourselves – if we use the lily in the pond model, what day are we on? The powers that be – like this example of the UN – are smart enough to get the basic numbers right, this is not the issue. It is what happens to those numbers – how they are interpreted – that is the issue. Analysis will show that the global and national institutions that run the show have a world view that was shaped by past experience. This is normal. The problem though is that what we called “progress” and successful in the past, in a planet where the global human population was much smaller and only a small proportion of that enjoyed the benefits of that progress and success, has now turned into a problem which threatens our survival in this new environment. As Einstein said – you can’t solve a problem with the same level of thinking that caused it. Progressive, enlightenment thinking, reductive science, competition, free-markets, democracy – these are belong to the world view or thinking that delivered us this personal freedom and economic growth that we take for granted and are even today fighting for. I don’t want to go back to an authoritarian or war lord past or live in a cave. So what is to be done? Clearly we are finding it difficult to come to terms with the fact that our world view is inadequate. The first step is to acknowledge this and change our language. We need to stop calling free-markets a success and stop deluding ourselves that the growth of cities can be sustainable.